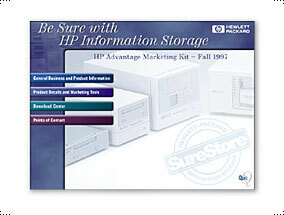 The HP Information Storage division needed a multimedia tool for the HP sales force which holds marketing information and tools that can be updated from the web. We designed an easy-to-use, drag-and-drop interface allowing users quick access to data sheets, logos, and various marketing materials. The hybrid solution allowed users to bridge the gap and gain access to the most-recent marketing materials available via the web.